Join Thousands of Chiropractors, Rehab Professionals & hospitals Who Trust Chiropractic Newsletter To Get More Patients, Increase Physician Referrals and Build Expert Status on Autopilot! "Who Wants To Deliver a Clear and Compelling Newsletter that Attracts New Patients and Influences Existing Patients to Refer Family and Friends to Your Clinic... Guaranteed?" Communication With Your Patients Has Never Been Easier – Automated, Everything Done-For-You; Chiropractic Newsletter Arrives by Email, Video, or Fax to Your Patients, Twice a month, Without Any Effort by You or Your Staff! What determines the ultimate success or failure of your clinic is easily defined: the number of acquired and retained patients. Successful chiropractic clinics are created by and thrive on a combination of proven systems working consistently together. Few, if any, practice owners when asked, can contribute their success to just one thing. However, all successful chiropractic clinics share this one vital trait: They are successful because of the relationships they have established with their patients. Patients don’t buy your services; rather, they invest in a relationship. Chiropractic Newsletter is guaranteed to help your clinic build trust and strong relationships with your patients, while educating them on your treatment philosophy and their treatment options. The days of putting up a shingle and waiting for patients to flood through your doors are over. Whether you are a solo practitioner, or the owner of a large clinic; you need to create a perception of who you are to your community, in order to distinguish your clinic from your chiropractic competitors, as well as from physical therapists, local doctors, and anyone else that could potentially steer your patients elsewhere. Twice each month, with Chiropractic Newsletter’s automated system, a content-rich, completely done-for-you newsletter, arrives via email, video, or fax to your patient list; delivering clear, consistent and compelling messages, professionally written, that influence and attracts more patients. You also have the option of a printable version for in-office displays and hand-outs to patients during their visits. Chiropractic Newsletter was created by a private practice owner who has an apprehension of the day-to-day pressures of running the business side of a practice; finding effective ways to market it to new and existing patients; establishing a rapport with your patients and keeping it – all while working long hours in the clinic itself. Each day, overwhelming feelings stronger as these tasks seem to grow while the time you have to do them seems to be continuingly shrinking. Can you really afford to spend valuable time away from patient treatments to write a series of newsletters twice every month that markets your clinic and maintains regular communication with your patients? Do you add more hours to an already long day racking your brain to write fresh articles, edit and properly format them? At the end of these tasks, are you too drained to spend any real quality time with your family and friends? Let Chiropractic Newsletter Supply Two Completely Done-For-You and Customizable Newsletters, Delivered in Multiple Formats, Every Month, On Behalf of Your Clinic. Chiropractors today need to acknowledge that they are a brand. Brands offer instant recognition and identification, with a promise of consistent, reliable standards of quality. Chiropractic Newsletter can help you and your clinic stand apart from the competition, by “building your brand” with new and existing patients. Every month the newsletter highlights different patient-relevant areas of chiropractic – building trust through understanding. Clearly define your niche in the chiropractic market – Let your patients know that chiropractors are more than doctors for back and neck pain. Myth a: Spinal adjustments are extremely painful. Myth b: Chiropractors have no formal education. When patients understand the “why” of what you do, trust is built – and trust generates revenues. 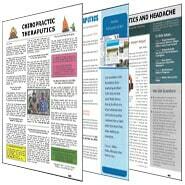 Chiropractic Newsletter’s content is customizable to serve the specific needs of your practice. After you login to your Chiropractic Newsletter account and access the content, you can make as many changes to any or all of the newsletter’s components. Email Yourself Five Past Chiropractic Newsletter Issues And Decide For Yourself. Stimulate Internal Patient Referrals with the inherent “refer a friend” feature. Chiropractic Newsletter is specifically designed to generate referrals from existing patients with its integrated “refer a friend” technology. A component of each newsletter; this feature stimulates internal referrals via an easy-to-use form. Transmit your customized newsletter content with the push of a button – taking your clinic’s message viral throughout the community utilizing state-of-the-art email, video and fax technology. Hand out copies of your customized newsletter to patients and local businesses by using a printable Word Doc. Twice each month, Chiropractic Newsletter is available as an attractive, completely customizable Word document providing you with the flexibility to rapidly customize and print high-quality color, or black and white newsletters that can be handed out to your patients and local businesses, further establishing you as an expert and authority figure within the community. Use Previous Content To Strengthen Your Message – as a member of Chiropractic Newsletter, you have the ability to re-use previously posted content from your website, office hand-outs, or authored newspaper columns – any copyrighted content that you own. Patients will be eager to give you their email address – Gather email addresses after patients come to your website by giving them access to FREE “patient stimulator” downloads of EBooks which Chiropractic Newsletter supplies. After new and existing patients leave their name and email information in the provided form – they gain access to these ready-to-use “lead generators” that are fully customizable on such patient-relevant subjects as: Chiropractic and Headaches; Chiropractic Treatment of Disc Herniation; and Chiropractic: Back Pain and Pregnancy. d) A “special occasion’ sequence (patient birthdays, anniversaries, and holidays)…and much more. Chiropractic Newsletter also has available a proprietary script to collect patient email addresses that can be used on the phone, in person, or in a letter. Tested and proven effective, this script will have at least 90% of those patients contacted happy to give their email information to you. Implementation of your customized newsletter takes 20 minutes or less – automating your practice’s referral generation and marketing. Even in the absence of a website, email patient lists, or technical knowledge, Chiropractic Newsletter can serve as your clinic’s all-in-one communication system, effectively creating rapport and trust with new patients, fostering internal referrals, and build loyalty with existing patients.